Yesterday's narrow entrance leads to the first of two very different garden "rooms" that make up Bill Reeves' back yard. If I remember correctly, the wooden pergola in the foreground connects this shadier garden to a sunny garden with a lawn and flower borders. The photograph was taken by Bill's son, Stan Reeves. 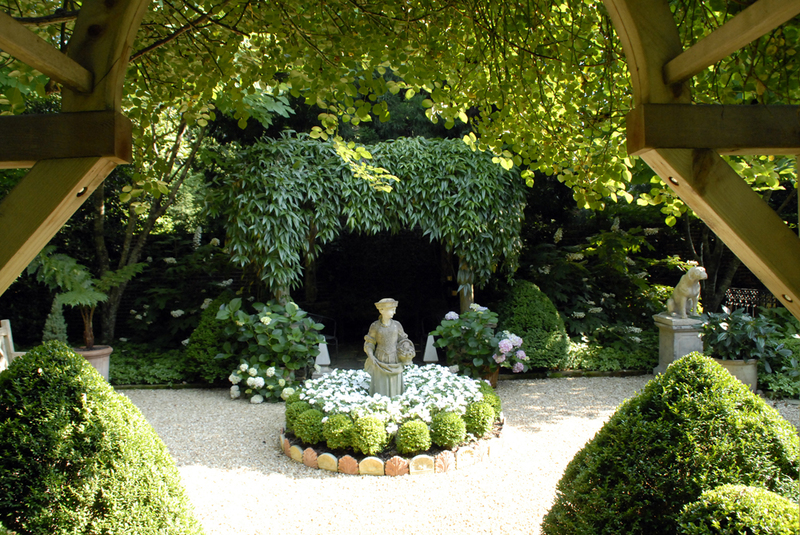 "Separated by a trimmed Leyland cypress hedge is the parterre shade garden of boxwood, hosta, pachysandra and hydrangea. Guarding the pea gravel path is a pair of 19th century Italian stone dogs (labs) on pedestals. The female figure in the center circle is probably English but was purchased in St. Simons, and the vintage birdbath (circa 1920) is from a Florida estate. Miscellaneous terra cotta tiles are from a demolished structure (late 19th century) in Savannah. A pair of Italian urns with zinc agave (French) flanks the garden exit." Not all of the elements mentioned are visible in this photograph. I could be disoriented a bit, but I believe the narrow passageway we saw yesterday is to the right side of the picture. I seem to remember the pergola draped in Clematis armandii and the Australian tree fern were to the right as we entered. Then, we turned left to go under the wooden arch to reach the sunny English garden. The garden room pictured here is more structured and formal than the sunny side. Both gardens are embellished with ornaments gathered from travels. The Reeves have been very generous in sharing their garden with visitors, and from the moment you enter, you can tell that the owners greatly enjoy every inch of their lovely creation. I was just recommended to visit your site, and "beautiful" does not seem like a powerful enough word to describe the content and inspiration found here. "A Gardeners Diary" was one of my favorite shows on HGTV, and your blog seems to fill the gardening void on that network. Glad someone pointed me in your direction. Cheers! Thank you so much. Did you know that some A Gardener's Diary episodes are now showing on Hulu.com? I think they put up about five episodes at a time, then take one down periodically. It kills me because I'm seeing all these gardens that would make great episodes. I do wish HGTV would have a show where one could see what other gardeners have done. To me, it's much more inspirational than a quick makeover where you never get to see the mature results. Again, warmest thanks.